I recently attended a sponsored screening of the new motion picture Mary of Nazareth, which has just been released by Ignatius Press. First off, let me tell you: I loved it. 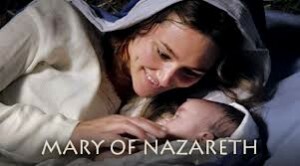 This full-length feature film about the life of Mary, the mother of God, was filmed in Europe and shot in English in high definition. It seemed to me to be a living, moving Carravaggio painting—with its rich color palette and the subtle interplay of light and shadows. The film vividly captures the essence of Our Lady’s profound faith and trust in God. She held a great mystery in her heart; but what struck me on the big screen was not the immensity of her role as the mother of God, but rather, her infectious joy. The film is long (two hours and 33 minutes! ), but my attention never wavered. I could be mistaken, but I think that while the main characters spoke English, there were some minor parts which were dubbed from another tongue—possibly Italian. That didn’t matter. The story, of course, was completely familiar—since it was all based on Scripture—yet I was not bored. In fact, I thought Alissa Jung, who portrayed Mary, delivered her lines in the Magnificat with such fresh honesty that I had a new appreciation for that beautiful prayer. I noted some anachronisms. Mary, Joseph and Jesus were fair-skinned, blue- or hazel-eyed, with light hair that seemed more European than Mid-Eastern. The clothing was lovely but perhaps more finely crafted than one would expect in a period movie from the first century. For example, Mary wore a lot of pink—something I’ve never seen in bible stories. Toward the end of the movie, Mary wears a deep blue veil of a delicate, almost sheer fabric edged in a richly embroidered gold band. She seemed appropriately dressed for a holy card, but oddly out of place on a dusty Nazareth hillside. Still, my strongest impression during the film was of the joy and the love that filled the screen, the pure goodness of the saints who walked with Christ. Mary (and Jesus, and many of the characters) smiled so much that I, sprawled out in my theatre seat, had a sore jaw from smiling back at them. I longed to meet these characters, to share in their laughter and their love. Heaven, I imagine, will be like that. And be sure to visit the website for more information about showings, and to see film clips. Kathy Schiffer is the wife of a deacon and mother of three grown children. For more than 20 years she has worked in the Catholic world, as a radio producer, conference director, event planner and media relations coordinator. She lives and writes in Southfield, MI. Visit her website at http://www.patheos.com/blogs/kathyschiffer.